I saw this quote on my Twitter account this morning — I looked it up and according to several web sites, the quote is from Jon Gordon. It summed up pretty well what leadership should be doing and seemed to fit this week's article to a tee! We had some wins last week but we cannot let up. There is still talk of a healthcare vote and we must not let up on our communications — phone and email, and really any way you can think of — to our Senators. Our students, their families and our schools need those Medicaid dollars! One thing I learned in the last few weeks in my travels.... we take for granted our colleagues are registered to vote, not talking about how they should vote but that they are even able to vote! One of the comments often mentioned by teachers when asked why they are not registered is "I don't want to be selected for jury duty!" Wow, really? First of all, serving on a jury is a privilege we should be stressing to our population, especially our educators! But secondly, are we as a district making it difficult for our teachers/staff to do their civic duty? Just as many schools do voter registration at their high schools, maybe a part of your teacher orientation and "welcome" back should be to do a voter registration campaign. I am sure if you contact your county Voter Registration office, they would be delighted to come to you and set up a station to make it easier for your staff to get registered. If they see you supporting it, then they are more likely to do it. Don't assume they are all registered! Public Schools are under attack and we need to make sure our employees are registered to vote and exercising their right and responsibility. Speaking of public school CASE has a position statement and there was a Brief on Public school from our recent Summit. You might also want to check out a couple of campaigns associations and states are doing on supporting public schools. Just to mention a few: the National School Board Association's (NSBA) "Stand Up 4 Public Education," AASA, The Superintendents Association, "Love Public Education", and a state example, Nebraska's "NElovesPS". Maybe now is the time for you to work with others in your state/province to start a similar campaign! I believe the attacks on Public Education are going to have long term detrimental effects as we see fewer and fewer students going into our profession — we already have a shortage, we can't afford for young people to decide not to be a teacher because they are bombarded by the negative! We need to balance the scales with our positive stories! And speaking of stories... As I said earlier in the article, we have had some great successes after our campaigns with our messages to the U.S. congressional delegations over the last two weeks. But we must remember effective advocacy is a 365 day event! As our congressional delegations return home for August recess, schedule meetings with them — invite them into the schools if you are back in school — even if you are not, invite them to some of your facilities to show them what Medicaid/federal monies are providing. Be sure to invite the press so there will be "photo ops" or take pictures and you share with the local press! Develop relationships with their district staff. Schedule calendar reminders monthly to contact the offices to say something positive about the school efforts to your Senators and Representative! Train your staff on how to get on the CEC Policy Insider so they will get the Call to Actions and how to use the CEC Legislative Action Center (LAC) to follow up. Help your staff to all have a personal email for these purposes. Get in the habit of promoting the positives of public education. You would be surprised how much damage is done by our own employees at the soccer fields and in the grocery lines! We must develop positive stories and tell them often! In other words," ... inspire, encourage and empower others to do!" Have you registered for the CASE Fall Conference in Reno, NV? Don't put it off any longer! Kindel Mason (ID), CASE Professional Development chair and his committee have put together an amazing program! The 27th Annual CASE Fall Conference will be held at the Nugget in Reno, Nevada, Nov. 2-4. Now is a great time to go ahead and reserve you room at the Nugget at the amazing group rate of just $81 a night — and that includes your airport to hotel and back transportation! Remember, if you are part of your State/Provincial leadership — the CASE Board of Directors will be meeting all day on Wednesday, Nov. 1 and the morning before the conference starts at lunch on Nov. 2! Information on the Board meeting logistics will be going out to the Board members in the next week. Be sure you have your annual report in to Emilie Maule ASAP so we will have the correct names and addresses to complete our communication. See you in Reno! 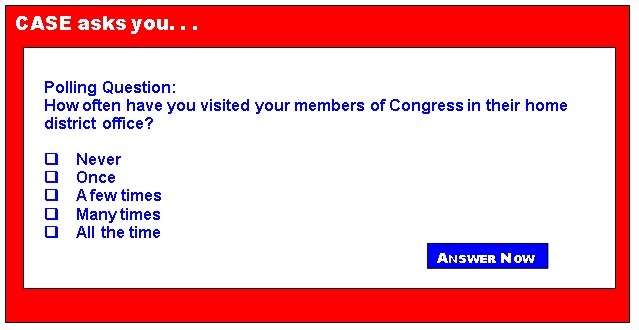 The question last week was "Was how do you communicate with your congressional delegation?" Looks like we are not much for Snap Chat, Instagram, Twitter, or even Facebook as the sole way to communicate with our elected officials, though some of us do it in our multimedia blitz with our elected officials — in fact, 25 percent do. But the number one way of communicating with the folks in DC is the CEC Legislative Action Center (LAC) coming in at 38 percent. Then tied for second place at 25 perc ent was all of the above and none of the above — we need to work on that group a bit more! Coming in third at 13 percent was face to face.